Thanks to Leroy Merlin’s application users can manage their connected lightning, alarm, rolling shutters, heater… at home or remotely with a smartphone. The “Enki” box help to create scenarios and improve the everyday comfort. A scenario for awakening, leaving house, holidays… the house is adapting to the user’s habits. The first brick proposed by Leroy Merlin is a free application available on Google Play and App Store. With it, users are able to manage more than 120 different connected products. An ecosystem was created in order to be able to pilot several devices even if they come from different manufacturers. This application is the main user’s interface: it enables users to install products, connect them to the house and to the box. The “Arrive/Leaving Home” scenario allows the user to control the activation of the lights and rolling shutters, set up the alarm and the management of the heating thanks to the intelligent device Smarther. With the “Wake up/Bedtime” scenario, all the devices connected to the plugs can be managed. At a specific time, the lights activate, the rolling shutters open, the music can start and so on. Celiane™ with Netatmo switches can be fixed or taped everywhere. Just a few minutes are necessary to parameter the box. It is a gateway allowing managing locally or remotely all users’ connected devices. This video presents the advantages of the Enki box. 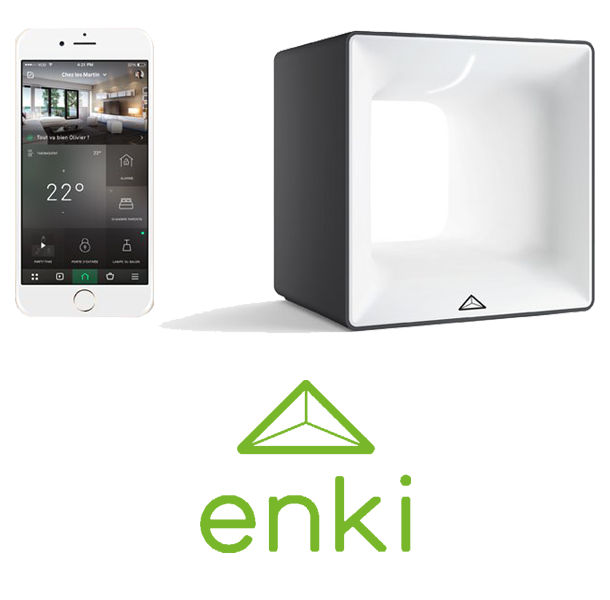 The connected devices (lights, rolling shutters …) adapts to the way of life by synchronizing to the habits of everyone. Also, Enki helps to manage the water, electricity, gas consumption and preserve the natural resources. Even if the user is far away from home, thanks to his smartphone, he can be warned in case of problem and keep an open eye on his family. With the configurable scenarios, each member of the family can feel like in a cozy nest.